Yesterday, fifth grade students from Meadow & Ropes took part in the outdoor portion of the Outdoor Classroom event. The event actually took place in early October, but weather prevented students from participating in the outdoor part of the program. Buffalo, range lands, natural springs and salt cedar trees were the topics discussed and observed by the fifth grade explorers. Employees of the NRCS and the South Plains UWCD gave presentations throughout the event. In addition to listening and observing their surroundings, students also collected specimens and wrote in their scientific journals. While exploring is a large part of the Outdoor Classroom event, its main purpose is to help students understand the land and natural resources around them. By collecting specimens, a direct correlation is made between the nature they see and the science they learn in their school's classroom. What is this type of plant called? Salt cedar trees are a non-native species. Did you know that? Wishing you all a happy and safe Thanksgiving! The Ag Career Expo is a day devoted to agricultural education. 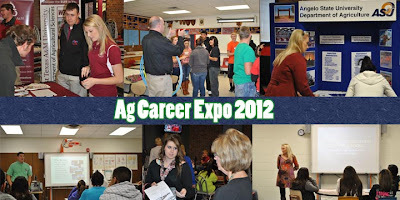 Its purpose is to give high school juniors and seniors insight on the opportunities within the agricultural industry. Students from Meadow and Brownfield got the chance to learn about agricultural programs in local universities, as well as career opportunities in the ag field. Going on its second year, ACE is hosted by the Terry County Extension office in collaboration with ag organizations around the county. With a line up of eight universities and eight career break out sessions, students received a well-rounded look into the agricultural industry. The colleges and universities in attendance were Texas Tech University, West Texas A&M University, Angelo State University, South Plains College, Sul Ross State University, Clarendon College, New Mexico Junior College and WorkForce, which is a job placement program for high school graduates. A portion of the program also covered scholarship opportunities, both locally and statewide. The key take away with scholarships is they are out there and very attainable for applicants who put forth the effort. Overall, the day was productive and important for the agricultural industry. Students learned about opportunities some never knew existed, while others learned more about their current interests. Thank you to Brownfield High School for being a great host and for making this event as successful as it was! We all look forward to the program next year. 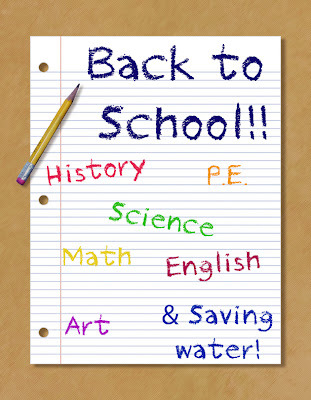 The winners for the PBUWCD 2013 water conservation calendar contest have been selected! 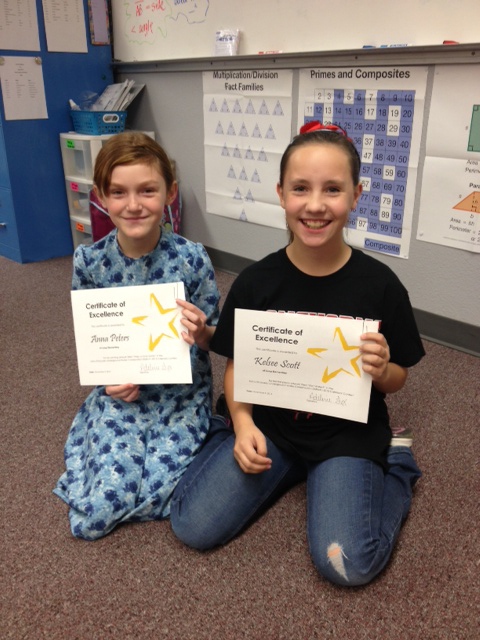 Fourth and fifth graders from Elbow, Grady, Sands and Stanton competed to earn a spot on the calendar. With approximately 300 students competing, it was tough competition this year, but the judges chose the top 13. Below is the video slideshow of this year's winners. Calendars will be ready before Christmas break. Thank you to all of those who won and to those who participated. The 2013 LEUWCD water conservation calendar winners have been selected! Throughout the month of September, the education coordinator gave presentations to the school districts in the Llano Estacado UWCD, which includes Loop, Seagraves and Seminole. Fourth and fifth graders from each school competed with a goal of being featured on the calendar. Out of approximately 450 entries, the top 13 illustrations were selected by the judges. Below is a video slideshow of the winners. Congratulations to all of those who won and to all of those who participated in the 2013 water conservation calendar contest. 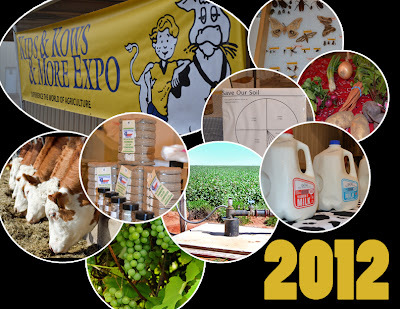 Kids, Kows & More went very well this year. The purpose of K,K & M is to provide awareness on many different entities and get students thinking about where their food, fiber and water comes from. Fourth graders from Terry County, came to Brownfield to learn about agricultural products and natural resources of the area. The topics on deck included lean beef, cotton, dairy products, vegetables, insects, water, soil and viticulture. Students observed demonstrations and learned information about each of the topics presented throughout the day. Our water presentation was based around how much water the world possesses. The lesson to be learned was that only one percent of total water on Earth is fresh water. Students were amazed to learn this fact and asked some great questions regarding salt and fresh water. I'm so glad they ask great questions because they really keep me on my toes! We also addressed the topic of groundwater and the Ogallala Aquifer by relating the percent of fresh water to our own way of living in Terry Count. Overall, the day was full of activities that got Terry County fourth graders thinking and wondering about the agriculture and natural resources we rely on in our daily lives. I can't wait until next year! The Conservation Jamboree is a day devoted to awareness about the industries that keep this region thriving. Its' purpose is to encourage students to think about and appreciate the resources we have here. This year's Conservation Jamboree was a great success! Approximately 155 students, from Plains and Denver City, explored the many industries of this area during the one day event. Students received first-hand information on rain percolation, farm equipment, electricity, branding, cotton gins, bugs, bees, water conservation, spices, soil types and peanuts. Each station gave ten presentations throughout the day. The water conservation activity revolved around water use. White boards were provided with dry erase markers and students had to guess how many gallons it took to produce things like an apple, a car, one pound of chicken, etc. The kids really enjoyed the activity and took away the concept that we do use a lot of water in items we utilize daily. In addition to receiving great information, students also had the chance to win door prizes by simply guessing how many items were in a certain container. Items ranged from bubble gum to cheese puff balls. Each station provided a different item for students to guess. If a student guessed the correct amount, they were awarded the full container of goodies at the end of the day. 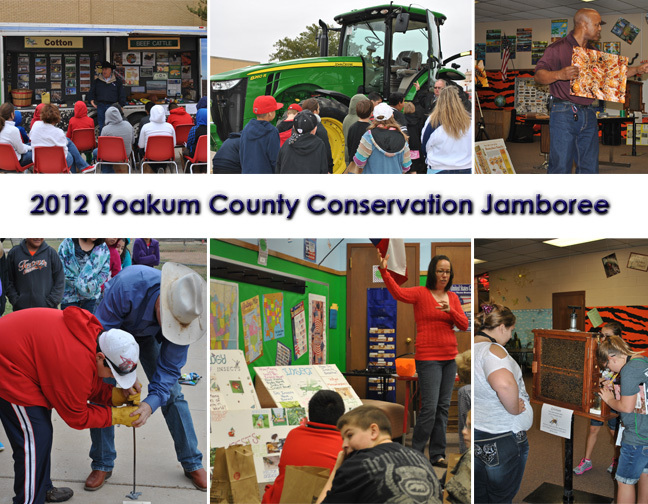 Overall, the day was full of knowledge and fun for the students of Yoakum County. I can't wait until next year when it comes around again! It has been awhile since I've been able to catch you all up on what's been happening around here. We have been so busy! I'll give you a recap of the past two weeks. The PBUWCD schools consist of Elbow (Forsan's Elementary), Grady, Sands and Stanton. Stanton is the largest school in this district having roughly 135 students between fourth and fifth grade. Once again, the students in these schools were great listeners. The best part about the water conservation calendar contest is spreading awareness and getting students to really think about their water use. Ag & Oil Day was a great event this year. For those of you who haven't attended, you are missing out on some great information about the agricultural and oil industries! Anyway, the event is open to the public, but schools from surrounding areas also attend. Student presentations take place in the park. This year students went to several stations ranging from homemade peanut butter to chuck wagon history lessons. The presentation I did was a game called "How much water does it take?" Students got into groups surrounding a small white lap board that they could write on with dry erase markers. I held up pictures of an apple, a pair of jeans and several other objects. Then I asked them to write down how many gallons of water it would take to make that certain object. The best answer of the day was 2,000,000,000 gallons of water. We do use a lot of water daily, but not quite that much! This wrapped up the crazy past two weeks really well. The Outdoor Classroom is hosted by the County Extension office each year. Students get a look into the world of natural resources, wildlife and water. Approximately 150 kids attended this year's festivities at Oak Grove Elementary, where the event takes place. It is normally a two day event, but due to weather, tomorrow's portion will be cancelled. Tomorrow would normally be the field trip day where students would get to go to a buffalo ranch and see springs. For today's presentation, I decided to have a hands on activity talking about the Ogallala Aquifer conditions in Terry County. The main purpose of this activity was to help the kids understand our water supply and how we utilize groundwater daily. Students were given a small-scale aquifer model with a plastic pipe, acting as a well. With a syringe, students extracted as much water as they could from the "aquifer" and then we discussed the technicalities and repercussions of taking more water up than is replenished in the aquifer. Overall, it was a great success. 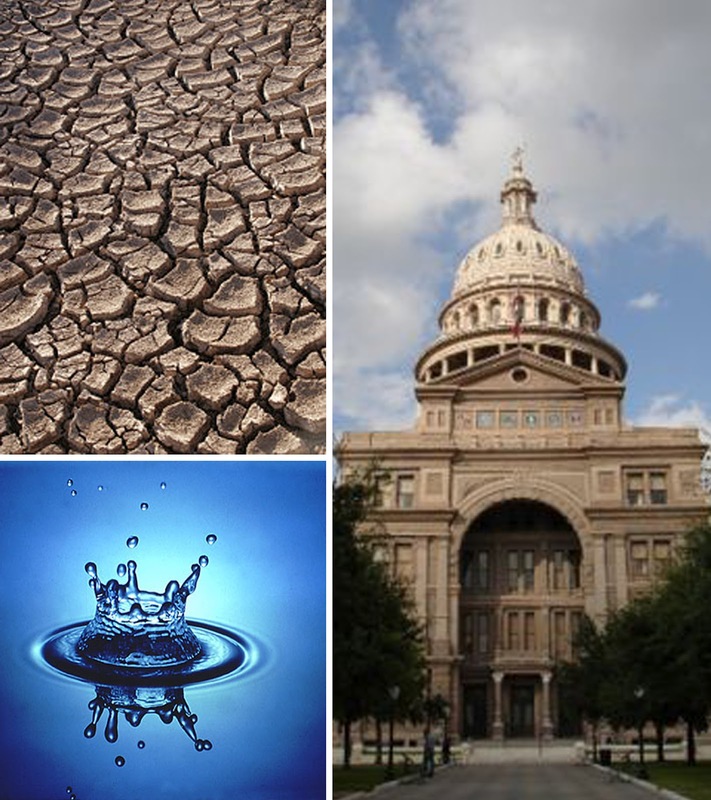 The Texas Alliance of Groundwater Districts hosted the first Texas Groundwater Summit this past week in Austin, where approximately 300 people came together to speak about and listen in on pertinent water issues. Several topics were discussed during the conference. Staff members from the Llano Estacado, Permian Basin, Sandy Land and South Plains Underground Water Conservation Districts, attended sessions addressing key topics regarding drought, upcoming state legislative affairs and general concerns about the sustainability of groundwater in Texas. Many stakeholders from the municipal, industrial, agricultural and commercial industries were in attendance, as well. With the 83rd Legislative Session revving up in January 2013, key issues to look for regarding water will mostly deal with funding. Of course, the long-term timeline for water planning, in every part of the state, is another important issue for everyone involved in the water industry. Overall, the conference was insightful for managing and maintaining the future of groundwater in Texas. 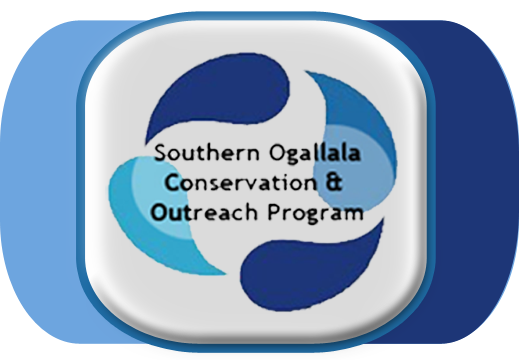 With school ready to kick off, the Southern Ogallala Conservation & Outreach Program would like to wish a great year upon all students in the 2012-2013 school year. 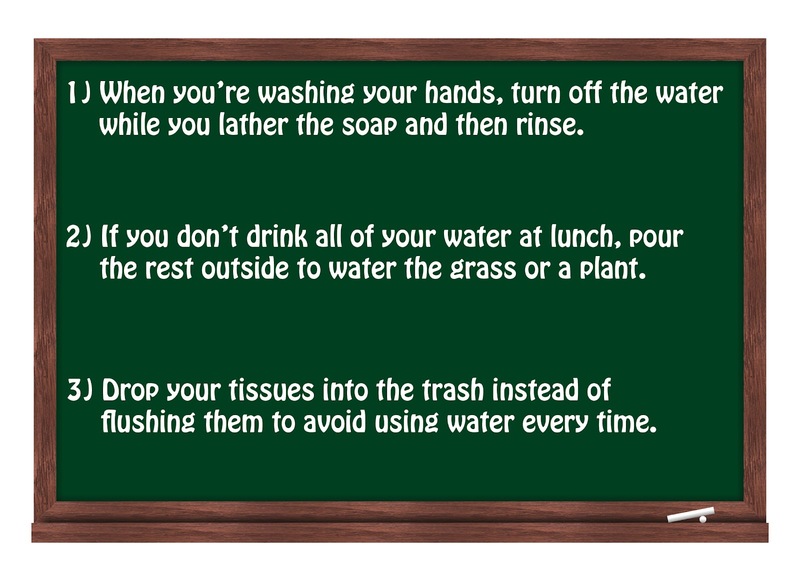 Getting back in the swing of class can be tough, but we also want to encourage getting in the swing of water-saving. 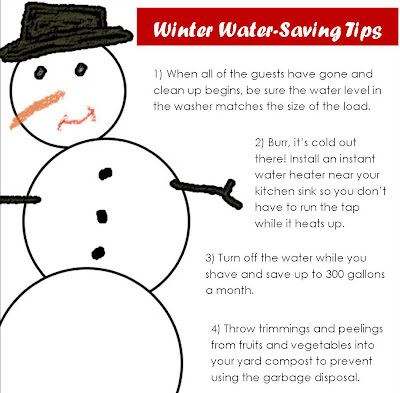 Water conservation can be practiced anywhere and at any time. 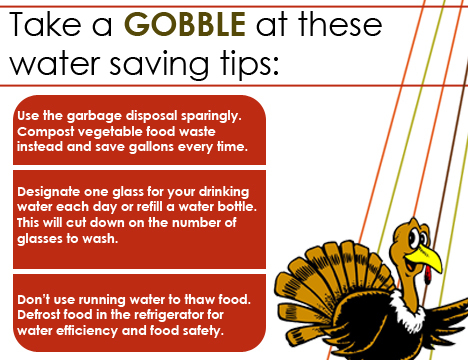 Make water conservation a habit and take action to save water. 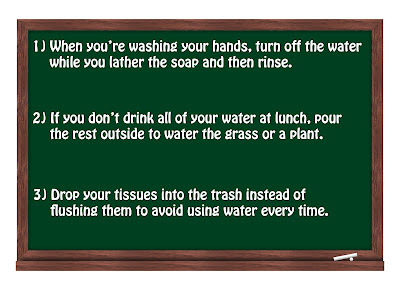 Below are some great tips to help you save water at home and at school! What does drinking water really do for your body? 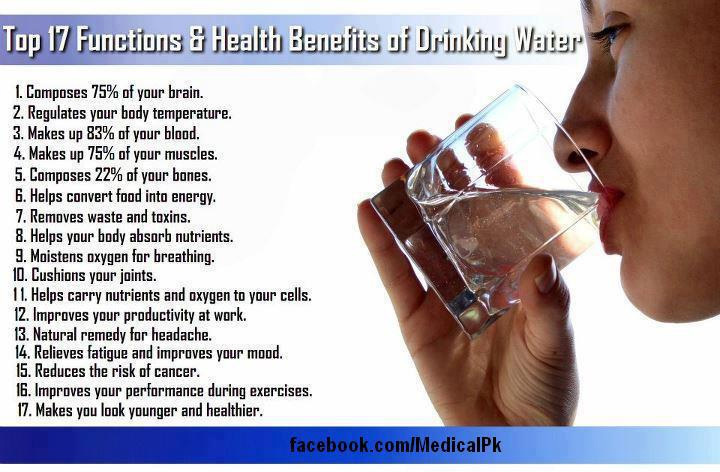 Drinking water is great for your body! Check out these top 17 functions and health benefits of keeping your body hydrated. I wrote the post about this event yesterday, but hadn't gotten the pictures yet. Here is some of the fun from the Denver City Library Water Olympics. Sorry for the delay on these! Pictures courtesy of the Yoakum County Library in Denver City. Thank you Maria! This guy was really good at not spilling water out of the mini shovel! Last week I had the pleasure of hosting the summer reading program for the Plains and Denver City libraries. Both groups of kids were great to work with, and I am always amused by what kids come up with in conversations. One girl asked if I was 30 and if I was I could date her dad. hahaha. I laughed really hard about that one. Anyway, the theme for the program was Water Olympics because the actual Olympics was right around the corner, and who doesn't like to pretend to be part of the Olympics? The events were far less intense, but the kids really enjoyed running around outside. The events included: shooting a basketball through a hoop into a water bucket, walking sideways and backwards while carrying water in a mini shovel and throwing water balloons through the Olympic rings. While we all had a lot of fun with the events, we also talked about how important water conservation is for the future. The winning team was rewarded with candy, which seems to be the best incentive I can find. I knew someone would want to do this! What percentage of water do we have in our organs? 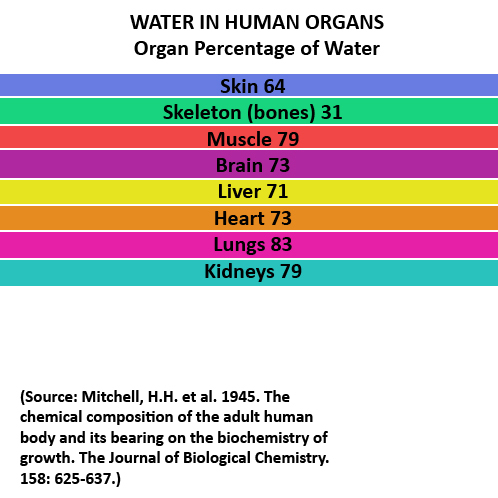 As I was looking up lesson plan ideas for the upcoming school year, I came across this really neat fact sheet about how much water is in our organs. I know this topic can be kind of "out there," especially since I usually don't post stuff like this, but it was just too interesting to pass up. Sixty percent of adult body weight is water. Wow. I knew the number was pretty high, but I started wondering where all of that water was located. Below is a small diagram explaining what percentage of water each vital organ is. I hope you find this as interesting as I did! We had a great turn out from the Sandy Land district too. Every student showed creativity and shared great tips about water conservation! Thank you to all of the winners and to all of the great participants. Enjoy this video that illustrates each drawing. Firstly, we had a great group of pictures this year from the whole district. Secondly, this video is a tribute to the great winners we had. 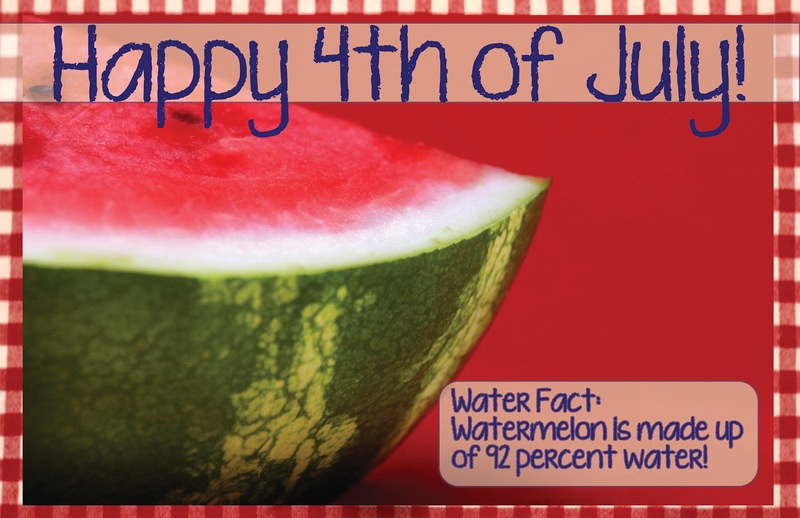 The calendar contest is designed for fourth and fifth graders who are given a presentation and then asked to interpret what water conservation means to them. These kids get really creative! Once again congrats to all of the winners, and thank you to all of those who participated! Enjoy the video! 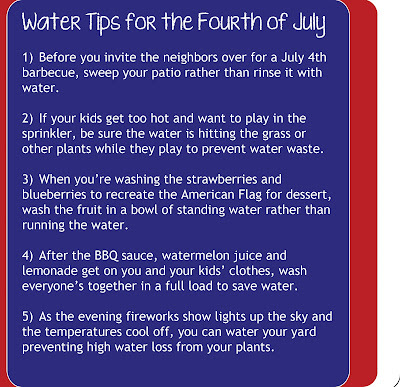 Save water this 4th of July! 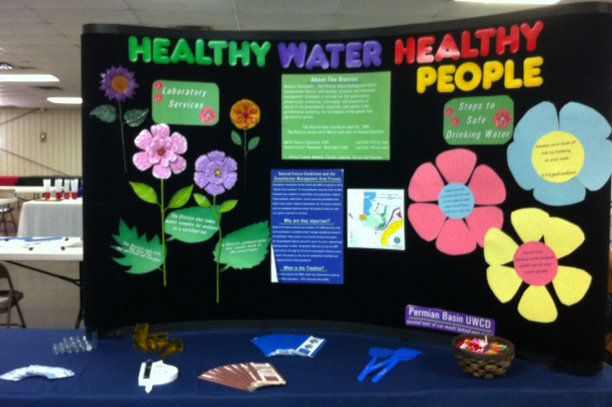 Last week, I traveled to the Permian Basin UWCD in Stanton to attend the Martin County Health Fair. The health fair brought together exhibits from across West Texas ranging from hospice healthcare to the importance of healthy water. Our exhibit encouraged the testing of water wells to ensure a healthy and wholesome water supply is available. Among this key message, we also spoke with several Stanton residents about water conservation. We passed out rain gauges, yard sprinkler gauges and an assortment of magnets and fly swatters. Overall, the message was well-received and people understand how crucial saving our water supply is. I look forward to having more opportunities to speak with West Texan residents on how they can do their part to save water and keep it healthy for the future. Below is a picture of the display. Conserving water is always important, whether it concerns brushing your teeth or watering your grass. Whichever way you conserve water, it is important that we understand our total water use. 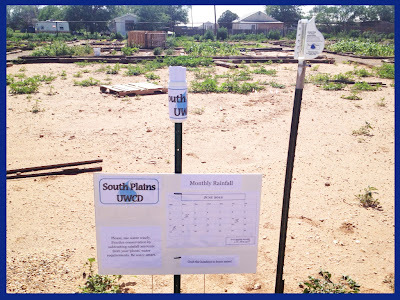 In a cooperative effort, the South Plains UWCD and the Terry County Garden Club are teaming up to promote water use awareness. It is vital to know exactly how much water plants need to reach their optimum result. In order to kick off the water use awareness project, we have developed a rainfall reporting method to help the Terry County Garden Club track the rainfall their garden plots receive on a weekly and monthly basis. 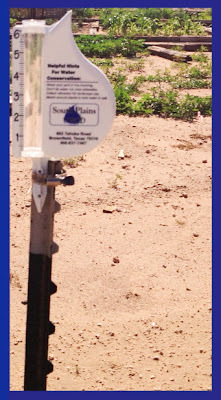 Knowing the amount of rainfall determines how often plants are irrigated. 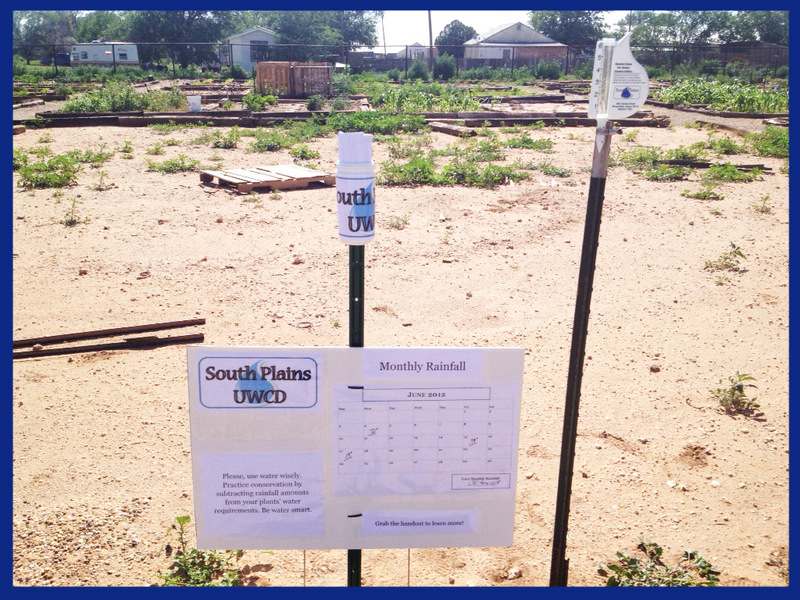 A rain gauge will be placed at the community garden to record rainfall. 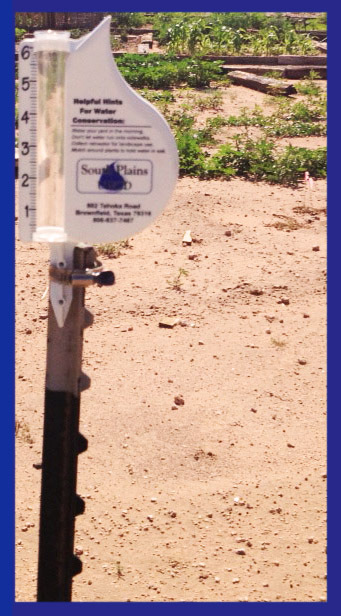 The rain gauge measurement will then be updated on the calendar and on a handout in the plastic tube. Garden club members are encouraged to periodically check the calendar and compare the amount of water applied with the amount of rainfall. Monitoring water use can save water and give your plants the best conditions possible to produce a great harvest. 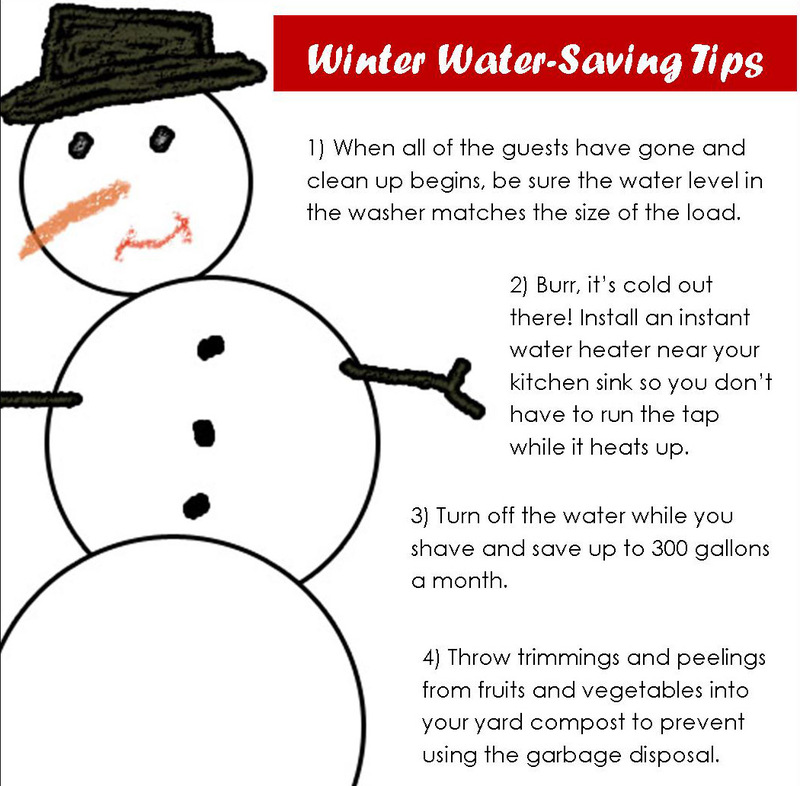 While this specific project is designed for the garden club, you can get involved too by becoming more aware of your daily water use. 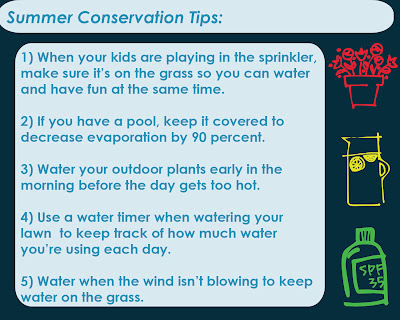 We encourage you to practice good water conservation to prevent water waste both indoors and outdoors. your water use and compare it to rainfall you receive. Don't forget to measure rainfall. Hopefully there's much more in store! 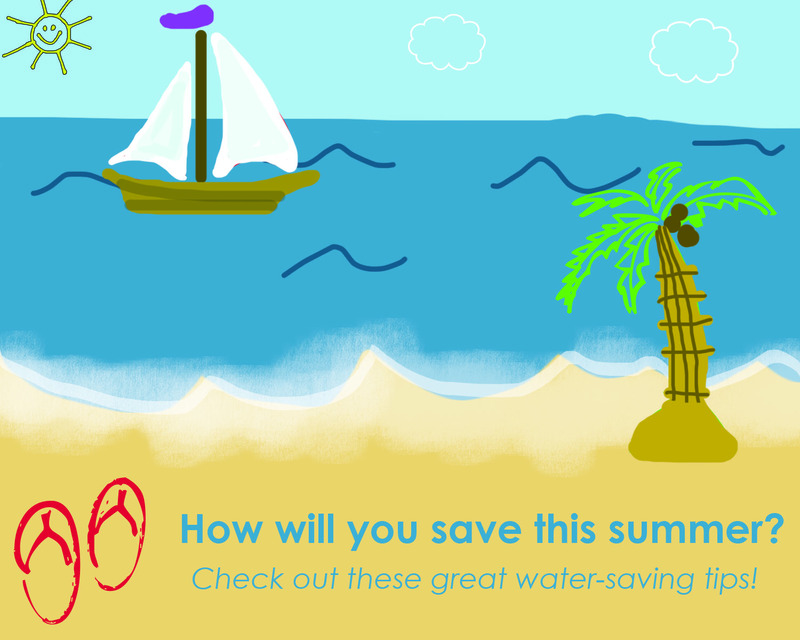 How will you save H2O this summer? 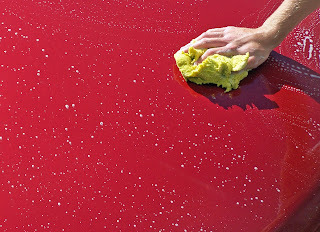 For most, washing a car consumes quite a bit of water. However, the Barton Springs/Edwards Aquifer Conservation District conducted a study to determine the exact amount of gallons used for washing nine cars. Depending on your "car washing conscience," you might even use less water than you would think. The District used water meters to test gallons used per car. Check out the full article and complete newsletter by clicking on the link below. Water is our survival. Without it, we cannot eat, drink or even be clothed. With supply dwindling and population growing, actions must be taken to conserve and maintain the water we have. The Texas Department of Agriculture is taking action by initiating the Texas Water Smart campaign. The water conservation coalition consists of public and private entities who have a vested interest in decreasing water use across the state. 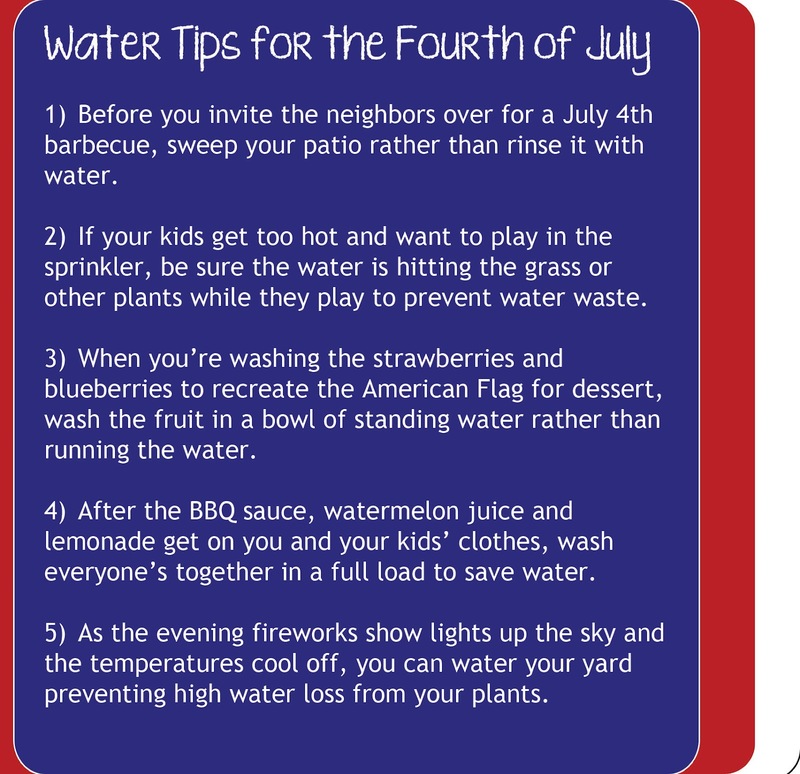 The campaign mainly focuses on garden and lawn care, however, the primary goal is to conserve water in any way possible. 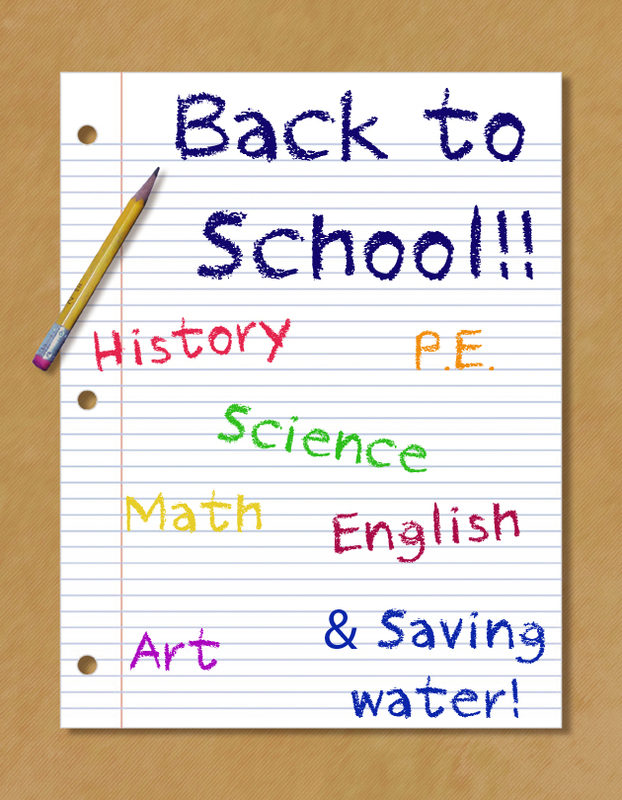 The Education Cooperative Blog will be down until March 1st. 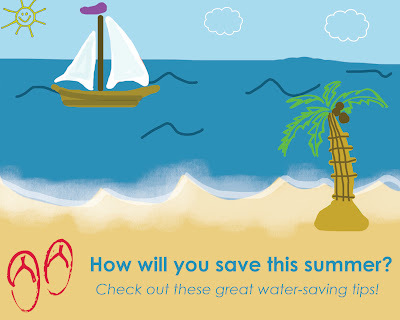 You can visit our website at www.savingh2o.org for any upcoming activities or announcements.